Today Tweek is taking you on a virtual trip. Don’t worry, it’s technically a business trip so you can count reading this as professional development. Y’heard?2 Mentally expense it. A couple of months ago Tony got in the car with his Hasselblad Xpan, Fuji XPro and iPhone and headed to the Deep South for about 36 hours. His final destination being New Orleans for the Scitex Eversmart Pro scanner we now have in our shop. Before we get to the Scitex and how awesome it is to have in our arsenal of equipment let’s take a quick trip with Tony. First off, talk about a street photographer’s dream…. New Orleans has beautiful architecture, quirky shops, a fantastic gallery3 as Tony found, and a few characters4. 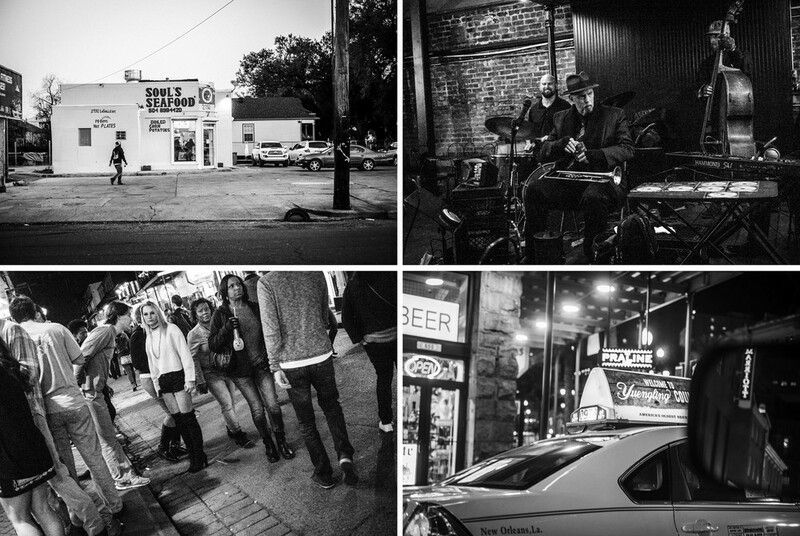 You can’t go to NOLA without walking the streets, eating all the food, and experiencing some late night jazz. Tony’s first stop was the Bourbon House for a heaping plate of sea creatures…with a side of brown liquor. Then of course comes night-life. Like a true pro, Tony ventured out around 10pm. Have camera will travel. And by travel we mean walk the streets until the wee hours of the morning. The next 12ish hours were spent sipping a Bloody Mary and sampling Beignets at the classic Cafe du Monde followed by a long walk to meet Richard Sexton for dinner at St. Roch Market5. You’ve really got to check out Richard’s site. Such an amazing body of work he has collected over the years. One other thing he collected was the Scitex scanner we mentioned earlier. Richard originally used the scanner for his film and especially for books he has published–one of those books centered around life in New Orleans. The life of the Scitex in the Tweek studio won’t be terribly different than it’s previous life down south. Well, one thing is different. A significant portion of the body of the Scitex shattered while Tony lightly braced himself during set-up at Tweek. Plastic from 1998 doesn’t hold up so well we found out. However, our old Scitex that decided to bite the dust had all the working parts needed to combine the two machines and rebuild the skin. So, you may be wondering why we are so excited about a big heap of crumbling plastic from 1998. Don’t forget it isn’t crumbling any more and know that this beast scans film AND reflective art/prints up to 12×17 inches! How awesome is that?! Scitex scanners were used for offset printing files and originally cost tens of thousands of dollars. This thing produces beautiful film scans6 with resolutions as high as 8000dpi! Come on now! Our Scitex is one of seven scanners at Tweek. One day we will get into the others but today we’re pumped to tell you about this 90’s fab scanner. We’re also pumped to take you on a little mental trip to NOLA. Sorry taste-o-vision hasn’t happened yet. Tony wishes he could share the tastes and sounds too. And don’t forget, as Tony says, “the best camera is the one you have.” Be it film or digital, take photos and then print them. You won’t regret it. We’re here to help you. 1According to Sunny Dawn Summers this is a New Orleans version of, “What’s up.” Taking our Southern nicity inspiration from the Deep South. 3A Gallery certainly is a Gallery for Fine Art Photography. Tony purchased our Scitex from this photographer who is featured among others you may have heard of…Ansel Adams, Henri Cartier Bresson…. “I had no idea I was walking into greatness,” Tony spoke of the gallery. 4Tony may or may not have had a curse put on him after documenting one scene….We know for sure he was yelled at. Stark contrast to all the wonderfully welcoming folks in the city. 5St. Roch was a big hit with Tony. Talk about a comfort food feast…mac’n’cheese, baked oysters, salad…ok maybe the oysters and salad aren’t a comfort food for all of you but maybe you should consider it. 6See Tony’s Xpan shots…they were scanned with the Scitex. Well hello there! Glad to see ya made it back to the ole Tweek blogsphere. Ok, enough with the niceties.1 This is to all those college students out there. Or even someone looking to update their professional portfolio. For a lot of you Spring Break is over and the reality of final projects is setting in. Maybe you’re starting to panic. PLEASE, please don’t! Your pals at Tweek are here to help. So, is there anything you can do to make this process easier this semester? YES!! Let us help!3 Our printers work; you don’t have to figure out how to print anything; the only thing you need to schedule is when to pick your print up; we will do the color matching; crazy-awesome paper options. Printing can be easy. Promise. Here’s what you do. Visit www.tweekimaging.com (you’re basically there already) and click the big red START HERE button to begin your order. Wait, before that you should probably enter your email address in the pop up window so you can take advantage of our 20% off coupon we are currently offering!! Want more help before you click that purchase button? We’ve got some more thoughts…don’t worry. Pre-Press: So, you’re a painter or sculptor and need your work photographed before you can even get to the point of making prints? You’re in luck! Tony works with artists to reproduce work in the digital world. Or, maybe, you’re an analog photographer? We can make high-resolution scans for you too. Let us know if you need photographs of your pieces. And be sure to ask about our high-volume reproduction discounts (10 pieces or more). Paper: You probably know this but your paper option can take your print to the next level. Maybe you want something with subtle texture like German Etching or maybe you want simple and smooth like Cougar paper or maybe an acid-free, 100% post-consumer recycled French Paper (currently have three options). OR, think outside of that dumb box we get stuck in. Sure there’s always tons of white paper options…and believe me, we have options.5 What about French Speckle Tone Craft?6 At 100lb cover weight this is something that can certainly stand on its own. Would that match a look you have going for a product you’ve designed or an identity package for a business? Yes, Tweek can even print that for ya! Our paper option prices start at $9 per square foot. 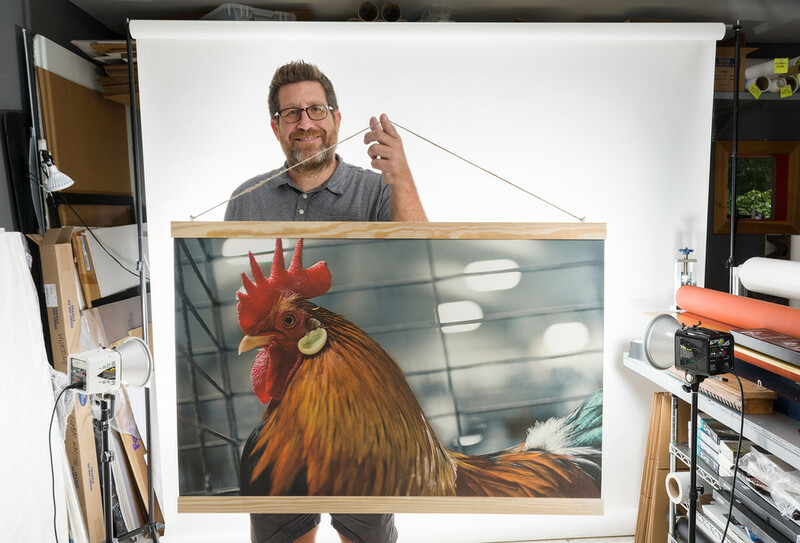 Presentation: How are you presenting your portfolio prints? There’s nothing wrong with the standard binder/book!7 This is easy for you to add to and take away from. Grows with you so to speak. 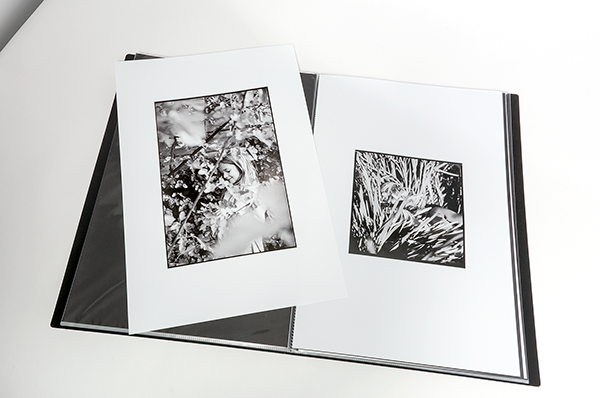 Emily, here at Tweek, recently finished her portfolio for her upcoming graduation and used a book.8 Emily shoots a lot of medium and large format film and we love how she positioned her images in a sea of negative space. Another option is a box similar to this. We can mat your prints to mat board or foam core so each print is easily handled and can stand on it’s own if need be. If you use the box in the link you can fit about 30 mounted images (100 unmounted). The box is also made with archival paper. Once you get that dream job, thanks to your killer work and perfect prints, you can store that box and look back at it years from now. Awe, isn’t that so sweet. *Most orders (3-5 prints) can be completed within 24 hours when placed before noon on a business day. If mounting is required more time may be necessary but you will get an email from us letting you know this is the case. 1. Reminder: We’re still southerners so we’re gonna do that real sweet, welcoming chit chat every time. Every time. We can’t not. 2. That will be figurative for Tony…you saw our picture last week…hair on the top of his head is a little lacking. The rest of us though…totally pulling our hair out! 3. Not even lying…Billy Swan was singing “I can help” when I wrote that. Check out the 70s Smash Hits Spotify playlist you young whippersnappers if you don’t know the song. 4. Tweek Headquarters is about six miles from the UT Art & Architecture building and about 20 miles from Pellissippi State’s main campus. 5. Paper options list: Ten options total plus two canvas choices. I hope you clicked this link so you can read the descriptions. We also provide sample books. 6. A Tweek favorite. That is what we use for Tweek branded materials. What can you do with French Paper? It’s no secret that we love French Paper. First of all, we love the company. French Paper is small, independent paper mill out of Michigan. It’s been family owned and operated for 6 generations, and their paper mills have been powered by fully renewable hydroelectric generators since 1922! On top of all of that, their website design and packaging are top notch. There’s litterally nothing not to like! Doesn’t Kevin look happy holding this French Print? We named this product after the paper it’s printed on, and honestly this is one of our favorite photo products that we offer. These huge prints look amazing, and come pre-attached to wooden rails. That means they are ready to hang – which makes your life really easy. They make a huge impact in a room. If you’re looking to refresh your decor, this would be a great place to start. This is one of our newest products! We are now offering bulk prints on French Paper in full or half sheets. Full sheets are 26×40 and can fit up to 54 4×4 prints, or 38 4×6 prints. 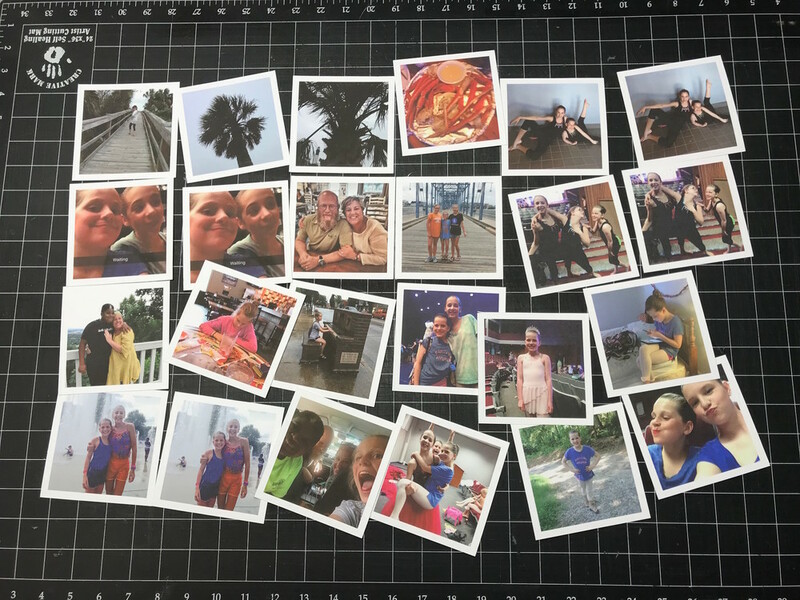 Half sheets are 20×26 and can fit up to 24 4×4 prints, or 18 4×6 prints. You’ll need to combine your prints onto one file to order at our discounted price. If you’re using Lightroom, we have some handy templates for 4×4 and 4×6 prints here. You can order these prints with adhesive attached to the backs, so that you can easily stick them up anywhere! We also think these would make great cards to send to clients or friends. That’s just two ideas for using French Paper. You can order prints in any size you like on French in our custom print shop, and if you have a totally unique idea please get in touch! We’ll do our best to accomodate! Nothing says LOVE like an accordion!